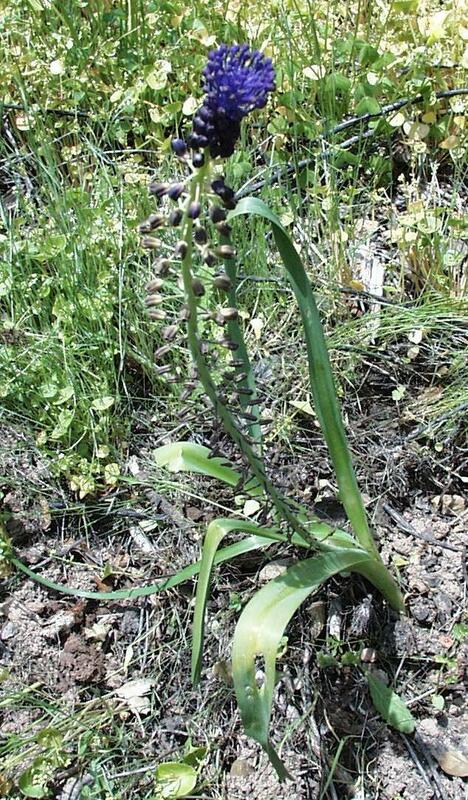 Thanks to Dr. Martin Guttenberger at the Botanical Institute of the University of Tuebingen, Germany, for identifying this plant for us! 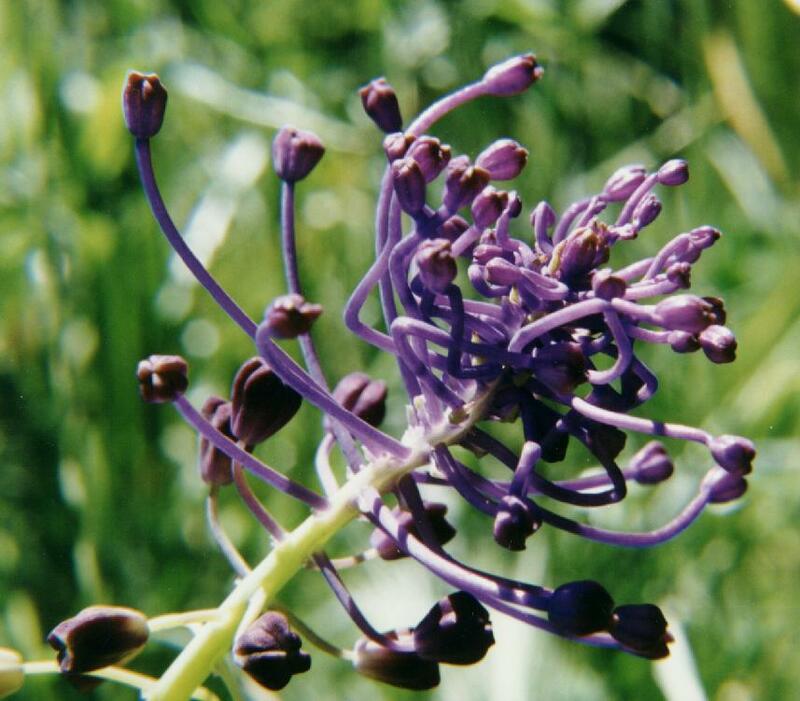 The stem + inflorescence grows to 60 cm. 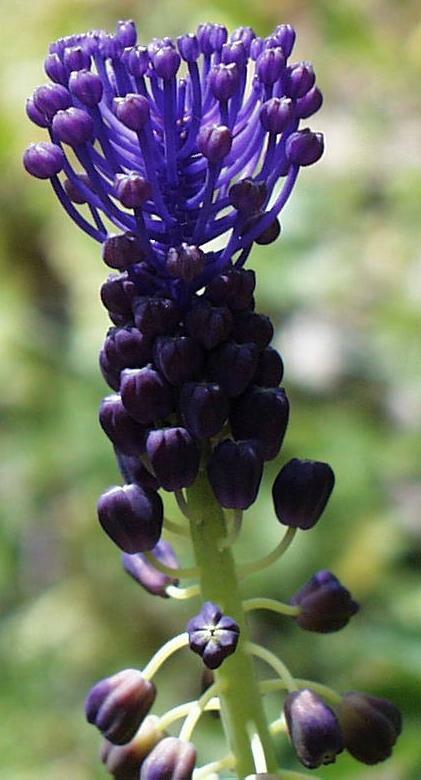 At the top long-stalked, violet, and sterile flowers, followed by fertile flowers which are short-stalked, blue and closed, finally brown-greenish open flowers at the base. Leaves to 1.5 cm broad, with a central groove and shiny. A mediterranean species which seems to do quite well at your place. it grows wild on limestone, but is so much appreciated in early spring that it is also cultivated. 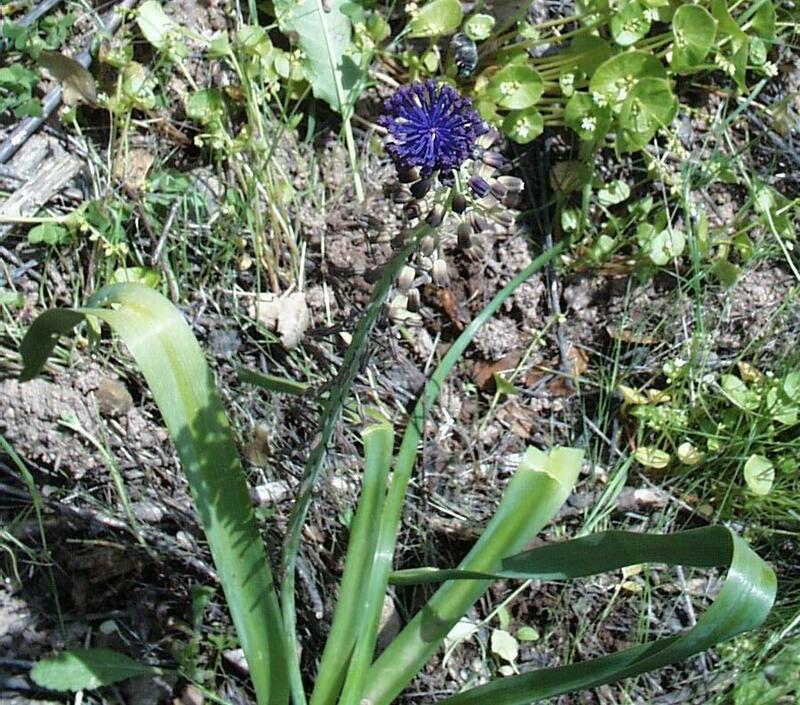 The wild bulbs are smaller and more excellent. 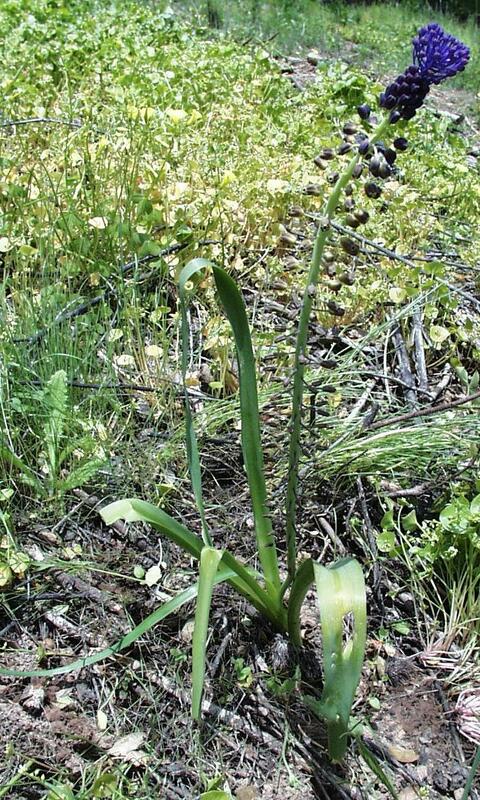 They are dug out of the earth when three straggly leaves first appear. Wash the bulbs, then boil them. When tender, say after 20 minutes, drain and remove the rough outer skins while warm. The peeled object slightly resembles a very small peeled onion, only it is tinged with faintest green and purple. Cut them in half (or not), sprinkle with salt, pour over them a little olive oil and wine vinegar. Serve cold as an antipasto; they are delicious. The corms of Crocus cancellatus on Naxos were prepared in the same way, dug up in autumn. 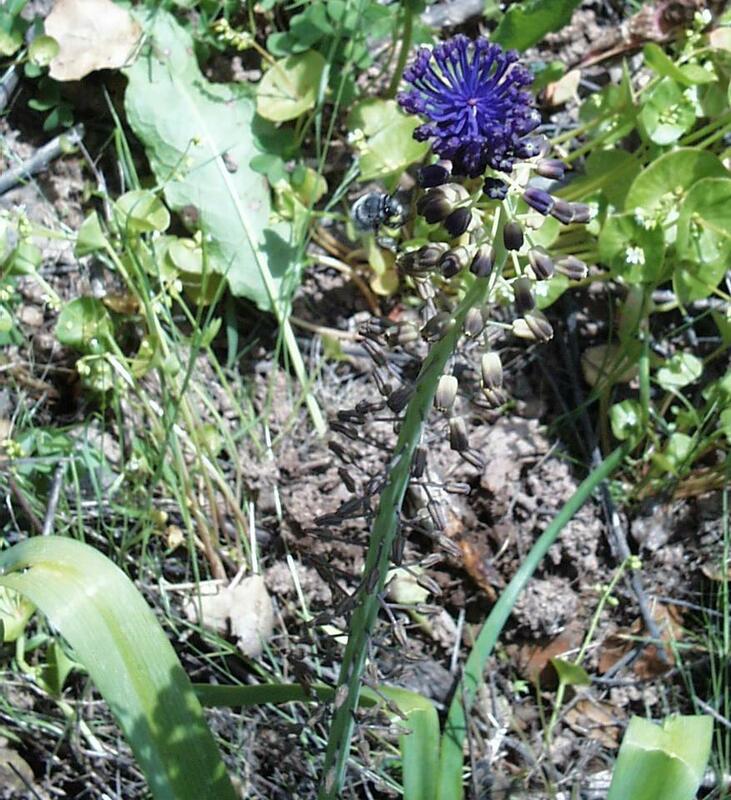 Note that the photos above and below show a bumblebee visiting the flower.